Croatia sailing and I finally have some wifi. Now this place is beautiful. One little bay after the next, blue blue crystal clear water, and idyllic seaside restraunts each night. Day 1 Picked up the Yacht from Dubrovnik ACI marina at 6pm and motored out to the island of Kolocep and anchored so we didn't have to stay the night in the marina. Had a quick rum on deck then ferried all in the tender to a little restaurant overlooking the water. Day 2 Sailed to Jakljan island and dropped anchor for lunch and a swim. 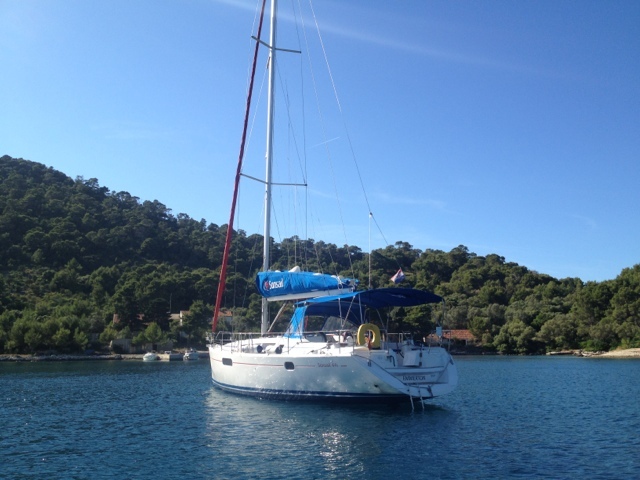 In the afternoon we sailed 16Nm to Mljet and picked up a restaraunt mooring. These are cool you moor then a guy comes out in his little boat to say if you Moor it is free but you must eat in his restaurant. Drinks, swim, shower and we were off in tender(dingy that just fits the seven crew) to the restaraunt. The restaraunt was overlooking the water and boats. As the sun set we feasted on beautiful BBQ fish, meat, pasta, beer wine, etc. 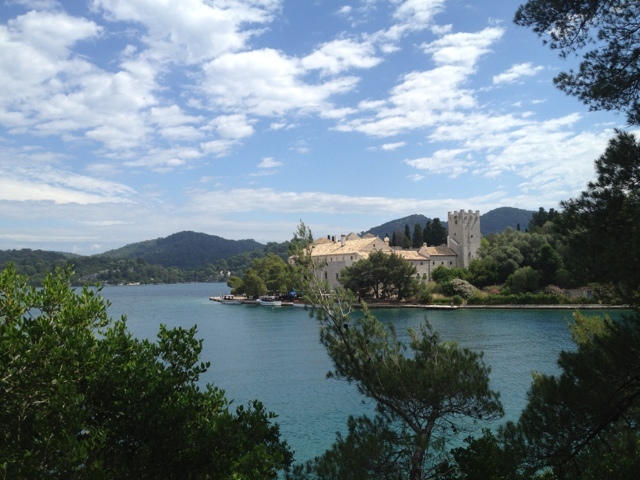 Day 3 today's weather forecast was for high winds and thunderstorms so we decided to stay in Mljet on the mooring and hire bikes to explore the islands national parks inland salty lakes. The ride to the lake tested our fitness but we were reward with scenery and a boat ride to a little island in the middle of rhe lake with an old monastery and cafe for lunch. Another advantage of staying in port is that we could order the specialty meals that required 3 hr to prepare. 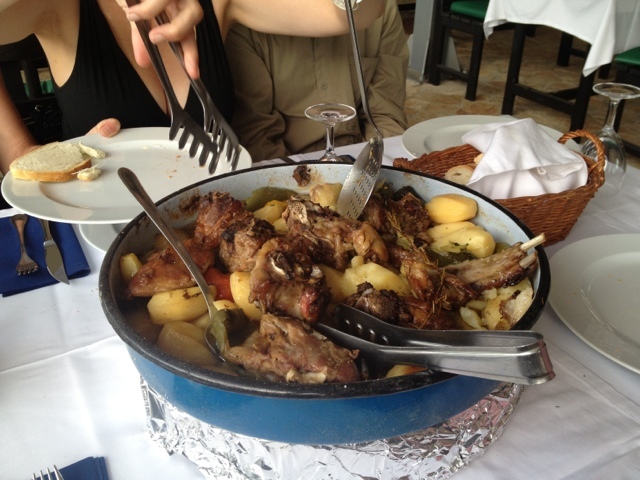 So this evening was spent consuming the most delicious roast lamb dish "Lamb under the Bell" (lamb and potatoes roasted on the open fire under a bell shaped lid that has coals piled on top) and goulash. This being our second night at the restaraunt they plied us with grape, walnut, plum, cherry etc tripple distilled Croatian rocket fuel. Day 4 David and I hopped on the tender to get 7 coffees and chocolate croissants for breakfast on the boat. This proved a little tricky as they didn't have take away so gave us a tray of coffees and said we could take them and return the cups. It was a great feat of balance and seamanship to get these coffees back to the yacht but we managed. 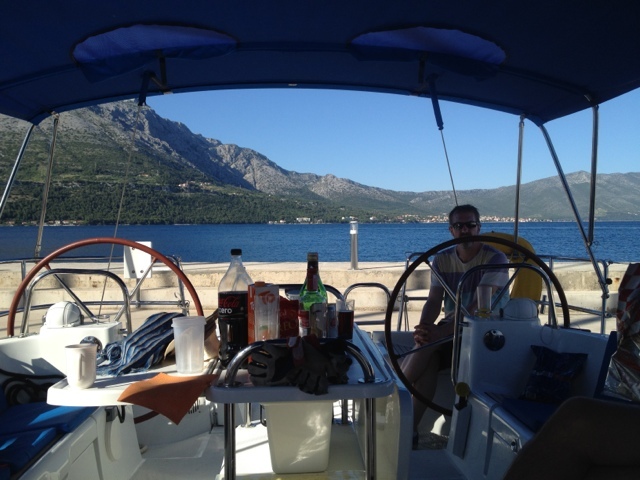 We tried to sail to the island of Korcula however it was only blowing 2kts so it was taking ages. 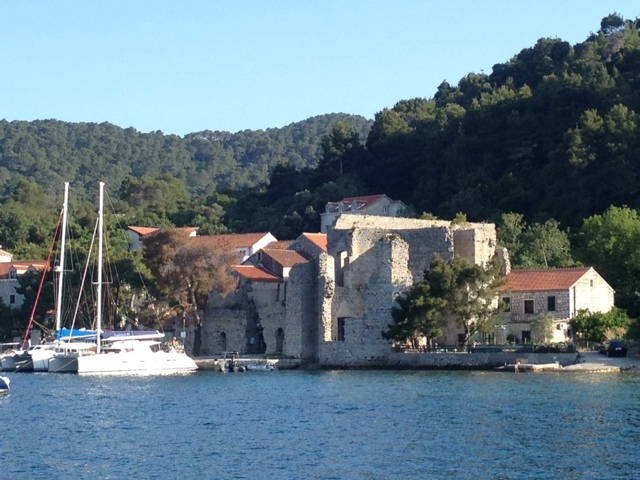 As several of the crew were feeling sea sick we eventually gave up and motored the remaining 16Mn to Korcula town where we took a berth in the marina. This gave us an opportunity to tale on water and recharged the batteries but also placed us 100m from the old walled town that was the berth place of Marco Polo. 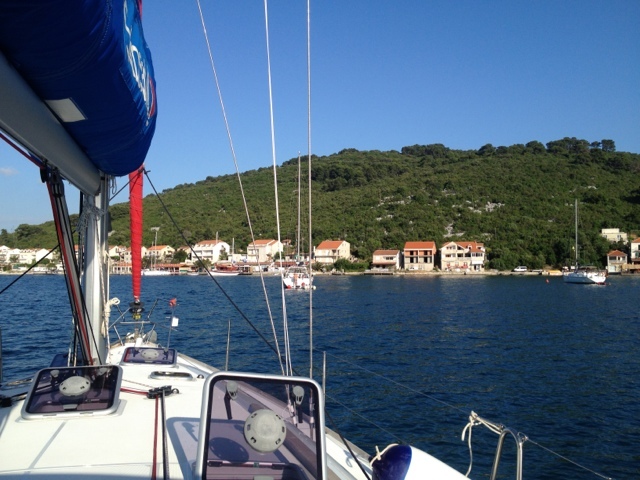 Day 5 sailed to the island of Lastovo having lunch on board. We anchored in the national park port of Pasadur which untill recently was not open as it was a cold war Yugoslav military area. 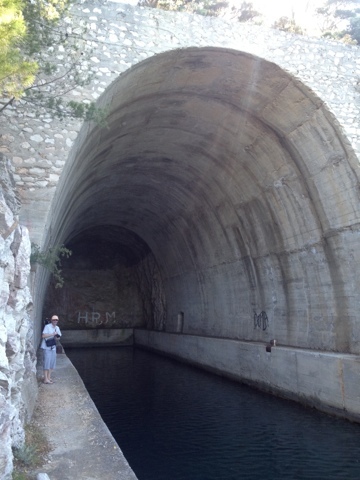 We explored an old submarine bunker and some swam ashore to look at the old baracks. 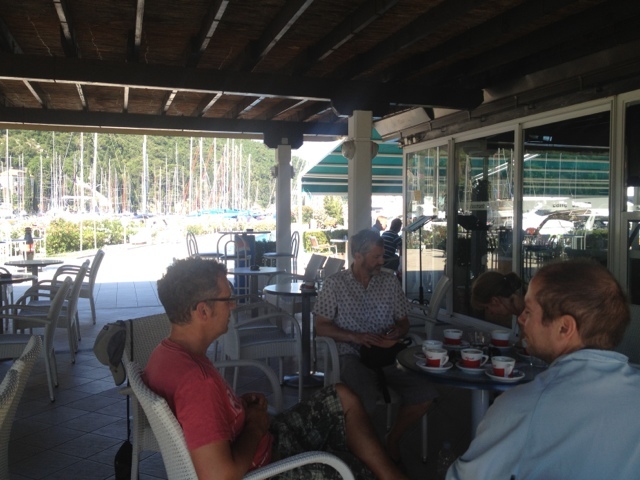 The afternoon was then spent swimming off the boat and eating ice cream at the taverna. We happened to be in time to order lamb under the bell again so made a reservation and headed back to the boat for drinkies and showers. Day 6 Wind was non existent and we had 47nm to cover to get us just outside Dubrovnik for a 9am drop off tomorrow. So we relied on diesel wind and I plotted a long straight course and set the auto pilot for 8 hrs of steaming. A bit dull but we did get a lot or reading, sleeping, lazing around the pd beer in. We made a tiny cove on the same island as our first night "Kolocep" this was very small and we got the little tavern to open especially for us. The last supper was great of a bit sad knowing we'd have to say goodbye to some of the crew tomorrow for who knows how many years. Day 7 awoke early to start motoring back to the Dubrovnik marina. them had a quiet coffee at the marina before catching cabs to our appt. 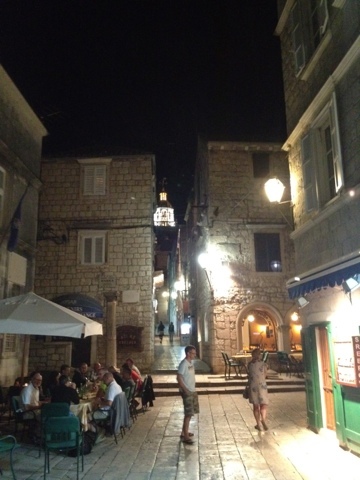 in the old town of Dubrovnik. Said our god bus to Cooma sandy Anthony and Alison then headed to the Buza bar on the cliffs outside the wall for a swim and a beer. Hi Marcus, glad to see you're back on the air - wonderful photos.